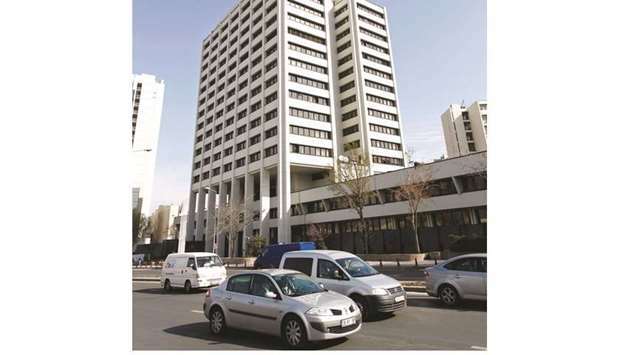 Traffic moves past the central bank of Turkey in Ankara (file). Nineteen of 21 economists surveyed in a Reuters poll said they expected the central bank to keep its one-week repo rate flat at 24%. It is expected to announce the decision on January 16. Turkey’s central bank is expected to keep its policy rate unchanged at 24% at a rate-setting meeting next week, a Reuters poll showed yesterday, maintaining support for the lira currency as inflation eases. Inflation stood at just above 20% in December, down from a 15-year high of 25.24% in October. The central bank hiked its one-week repo rate to 24% last September to help support the tumbling lira. Nineteen of 21 economists surveyed in a Reuters poll said they expected the central bank to keep its one-week repo rate flat at 24%. It is expected to announce the decision at 1100 GMT on Wednesday, January 16. One economist said he expects the rate to be cut to 22.5%, while another estimated it would be lowered to 23.5%. Burak Kanli, chief economist at QNB Finansinvest, said he did not expect the central bank to cut borrowing costs this time but that its statement could be more dovish, adding that the bank might start lowering rates in April. “There will be a substantial fall in inflation and, when we take into account the slowdown in economic activity, I don’t think that a rate cut by the central bank in that period would be regarded as strange by the market,” he said. The lira shed nearly 30% against the dollar last year amid investor concerns about the central bank’s ability to resist pressure from President Tayyip Erdogan to cut borrowing costs in order to boost economic growth. The bank’s decision in September to hike its main rate to 24% helped the lira recover some of its losses. It came under renewed pressure after a bigger-than-expected fall in inflation in November and December fuelled concern that the bank would cut rates earlier than warranted. The lira stood at 5.4450 to the dollar at 1153 GMT yesterday, down 2% from last Friday. It hit a record low of 7.24 against the greenback on August 13. Last year’s currency crisis also exposed the fragility of Turkey’s economy, which is reliant on foreign credit. Banks are seen as particularly vulnerable, because of both their own external financing and the likelihood that the crisis will cause more firms to default on debts at home. Meanwhile, Turkey’s current account showed a surplus of $986mn in November, central bank data showed yesterday, as economic activity remained slow and import prices remained high due to the lira’s steep decline last year. The current account has been a major concern for investors as it has long been in deficit, making the economy reliant on speculative foreign inflows to finance the shortfall. November marks the fourth consecutive month in which the current account recorded a surplus, as Turkey’s trade deficit, the largest component, fell sharply due to higher import prices. A Reuters poll of 18 economists forecast a surplus of $965mn. The median estimate for the full-year deficit is $28bn, according to 17 economists. That compares to a $36bn in a government forecast announced in September and a $47.4bn deficit in 2017. Finance Minister Berat Albayrak has said the 2018 current account-to-GDP ratio is expected to be around 3%, down from the 4.7% previously forecast. The lira lost nearly 30% of its value against the dollar in 2018, raising investor concerns over the fragility of the economy, which is reliant on foreign debt.